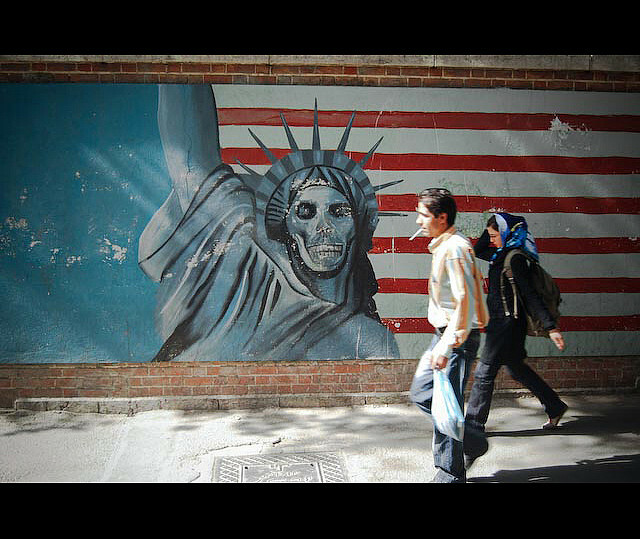 Iranians walk past anti-U.S government murial in Tehran. This article was published in the 'U.S. 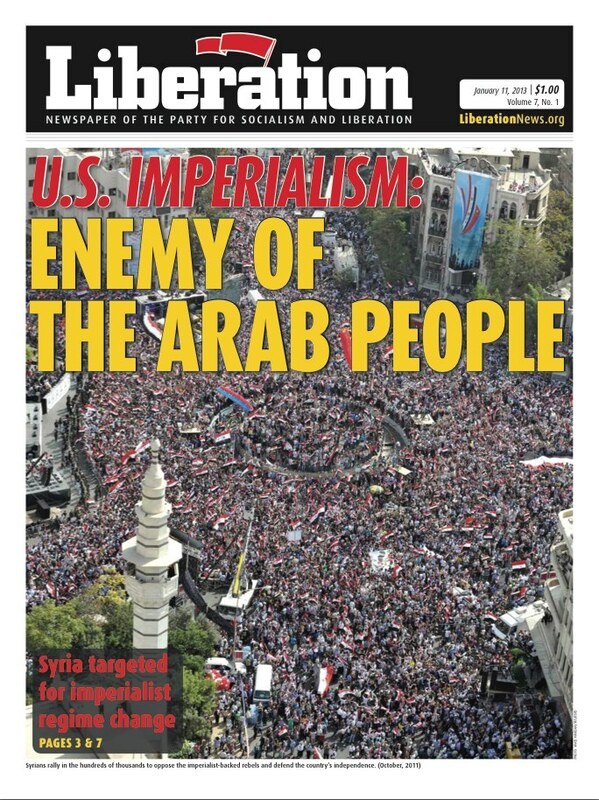 Imperialism: Enemy of the Arab People' Edition of Liberation. View the complete issue at LiberationNews.org. The latest round of U.S. and European Union sanctions on Iran have had a devastating impact on its economy. Over the last year, Iran's currency, the Rial, has lost nearly two-thirds of its value. This has resulted in runaway inflation and the destabilization of the economy. Predictably, the working class and the poor have experienced the worst of this economic crisis, struggling to survive when the prices of necessities have gone up astronomically. In addition to inflation, sanctions have caused serious disruptions in many areas of the economy. By essentially locking the Iranian government out of the world trade system, it has made it nearly impossible to acquire raw materials, machine parts and other supplies to keep the country going. Sanctions have also affected people seeking medical care. On Sept. 4, 2012, a Washington Post article reported that medication shortages caused by the sanctions are particularly affecting “cancer patients and those being treated for complex disorders such as hemophilia, multiple sclerosis and thalassemia, as well as transplant and kidney dialysis patients.” This is the real-world deadly impact of the sanctions that both President Obama and Mitt Romney called “successful” in the presidential debates. Threats of a U.S. military attack on Iran have been constant over the last decade. “All options are on the table” has been the mantra of both the Bush and the Obama administrations. The demonstrated willingness of the White House to use deadly force all over and launch undeclared wars means that no person can take these as idle threats. There has been much talk of Israel wanting to bomb Iran, but the United States is supposedly holding it back. But aside from the practical difficulties of any such military assault, such an attack could also backfire in terms of their ultimate aim of regime change. Despite the off-and-on war threats, the United States, its junior partners and Israel clearly hope that crippling and deadly sanctions will make regime change a more likely possibility. The U.S. foreign policy strategists are hoping that the June 2013 presidential elections in Iran, in an atmosphere of a distressed economy, will provide an opportunity for supporting a “democratic” opposition. Less than two years after President Ahmadinejad was re-elected in 2009, the dominant factions of the Islamic Republic have isolated him politically. Ahmadinejad is not eligible to run for re-election, nor does his faction have a prominent successor. U.S. strategists hope that severe economic hardship will strengthen the hands of those factions in favor of reaching an accommodation with the United States. If such a faction emerges, it is likely that the social base of the right-wing Green movement that arose in the aftermath of the 2009 elections will rally behind it. This may provide an imperialist opportunity to support, promote or even fund the election campaign of such forces, helping destabilize the country. This is by no means a sure thing. Two factors make the emergence of an accommodating faction less likely. First, following the 2009 post-election events, much of the leadership is wary of the possibility of the rise of another pro-Western movement, which would threaten the survival of the state, not just one particular faction. Another factor is that, in every round of “negotiations,” the Western powers have made it clear that they will settle for nothing less than Iran's complete surrender on the nuclear issue. Hence, the moderate factions of the Iranian political establishment - who would prefer realignment towards the West - can point to little potential benefit for making major concessions. Following World War II, with the rise of the United States to the top of the imperialist hierarchy, control of the Middle East became a key component of U.S. foreign policy. One look at the map of the Middle East makes clear why U.S. foreign policy strategists see control of Iran as a key objective. Iran is the 18th largest country in the world in terms of territory, covering 1.6 million square kilometers to the north of the Persian/Arabian Gulf. It controls the critical Strait of Hormuz, through which passes over one-third of global shipments of oil. With proven reserves of 150 billion barrels of crude oil and 33 trillion cubic meters of gas, it has one of the largest fossil fuel reserves in the world. Iran is not just a potential source of raw materials for giant oil corporations to exploit. Iran’s market represents a potentially lucrative opportunity for multi-national corporations, considering its strong infrastructure in communications, transport, basic industries and a highly educated workforce. With nearly 80 million people, it is larger than France, Turkey and Italy. Not long ago the United States did effectively control Iran during the period of the Shah’s rule. The Shah was installed in 1953 in a U.S.-engineered coup to topple the democratically elected prime minister, and for over 25 years U.S. and other oil giants made handsome profits from Iran's oil. Politically, Iran did the bidding for the United States in the region. Its military, armed to the teeth with U.S. weapons, earned the nickname of the “Gendarme of the Persian Gulf.” In the 1970s, the Shah helped the reactionary kingdom of Oman crush the Dhofar liberation movement led by the leftist Popular Front for the Liberation of Oman. But that relationship changed decisively with the 1979 revolution that overthrew the Shah. Iran ceased to be a client state. The Islamic Republic represented the interests of the national bourgeoisie and clerics - not the Iranian working class - but it broke free from the United States and took an independent path of development. Oil was nationalized and government-run domestic industries were prioritized. Internationally, Iran frequently took anti-imperialist positions, offering support to the Palestinian movement and many others. Since the revolution, U.S. strategy towards Iran has effectively been regime change. Washington encouraged Iraq to invade Iran and provided Iraq with arms and support during the 1980-88 war. The U.S. objective was to weaken both independent states, as evidenced by the Iran-Contra affair, during which the United States also provided arms to Iran. Over the last decade, Iran's nuclear development has been the focus of intense U.S. propaganda against the country. But this is just a public relations ploy, a justification designed to hide the constant objective of effecting regime change. Serving the banks and mega corporations, the U.S. government wants to overthrow the Islamic Republic and replace it with a client state - a return to the days of the Shah. Whatever form of intervention the United States employs against Iran, it will encounter the resistance of a people proud of their independence. If the United States were to eventually overthrow the Islamic Republic of Iran, it would possess near complete control over the entire Middle East. This would not just be a setback for the people of the region, but all countries attempting to pursue an independent path of development. The only beneficiary would be the U.S. capitalist class, which plunders countries abroad, while exacting non-stop exploitation and oppression on poor and working people inside its own borders.